Part 3 of the Epic Trip. March 30 – April 2. 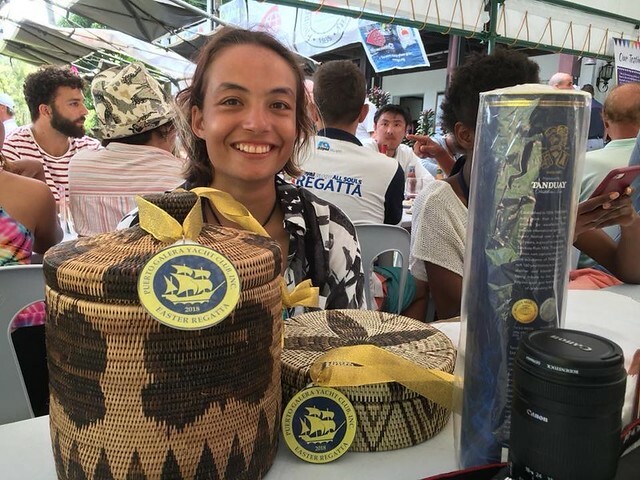 Puerto Galera Yacht Club Newsletter covering the Regatta. Thursday: Nice BBQ party at the Clubhouse. During the delicious welcome BBQ at the Yacht Club Peter gave a welcome speech. 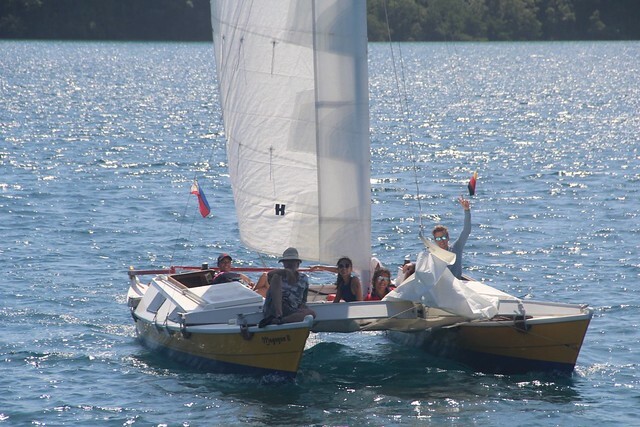 He introduced the 15 competing boats and welcomed the three newcomers, among them us. 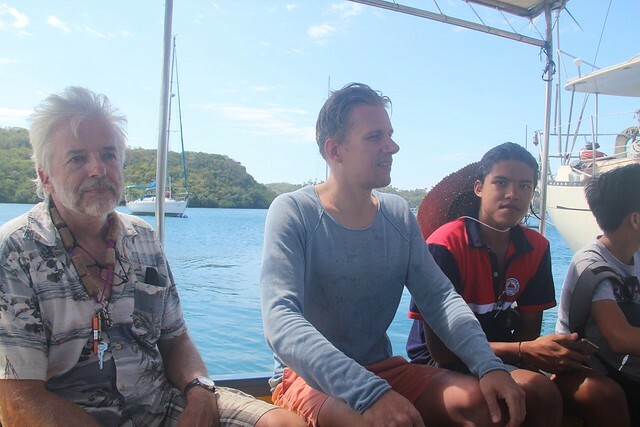 “And then there is this gorgeous little Wharram, Magayon II, with the skipper Miriam Gummert. 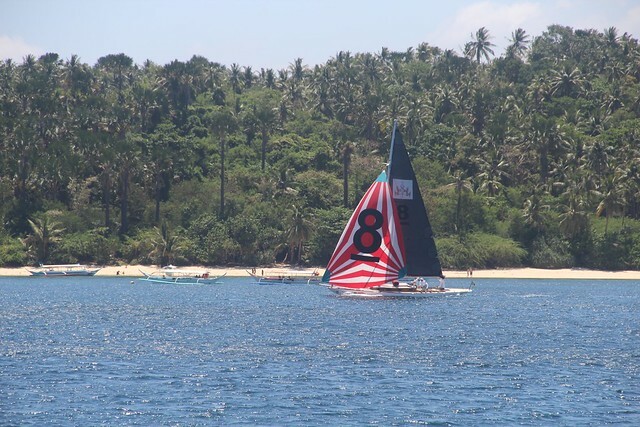 Remember when you sail and you see them, they are racing and not a marker.” We all were quite exhausted, with half of the crew flying in from overseas the previous day and having had problems with getting their boat in Batangas port, and the rest coming from a one week working trip to get Magayon II here. There was little wind in the morning and little waves, it was supposed to be pick up after lunchtime and then be stronger tomorrow and on Sunday. The route was explained, and starting sequence announced. We were the third to go over the starting line at 10:36.40 GPS time and we had to kill the engine 4 minutes before that time. Then we collected the sandwiches, which we had ordered the night before for the carnivores among us, three blocks of ice, and two crates of beer, one with San Mig. Light and the other with Pale Pilsen. 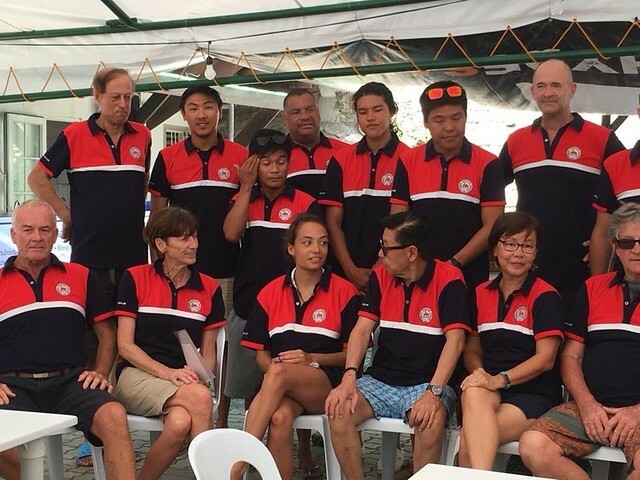 Good luck wishes to some of the competitors, and then Miriam and Martin took the service boat to Magayon II to get her ready. In the meantime, the rest of the crew did some last minute shopping for veggie staff for the vegetarians and soft drinks. 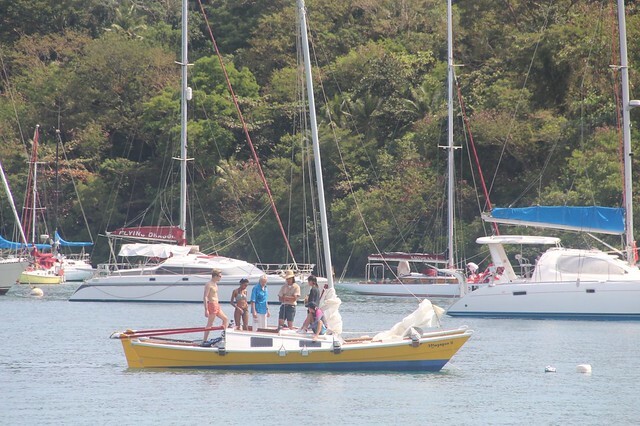 They then came aboard with the service boat and got an introduction of the don’ts and dos. 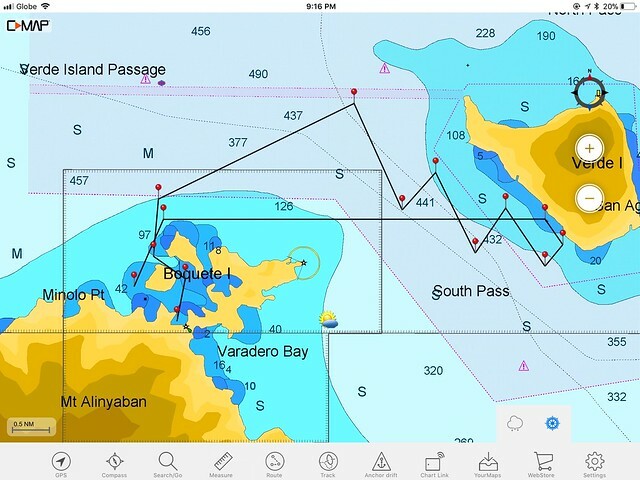 The crew stored the supplies provided by the PGYC and the merchandises, we detached from the mooring and motored out to the bay, and were ready to race. All the non sailers who wanted got the chance to steer the boat a bit under motor before the race began to familiarise themselves with the boat. 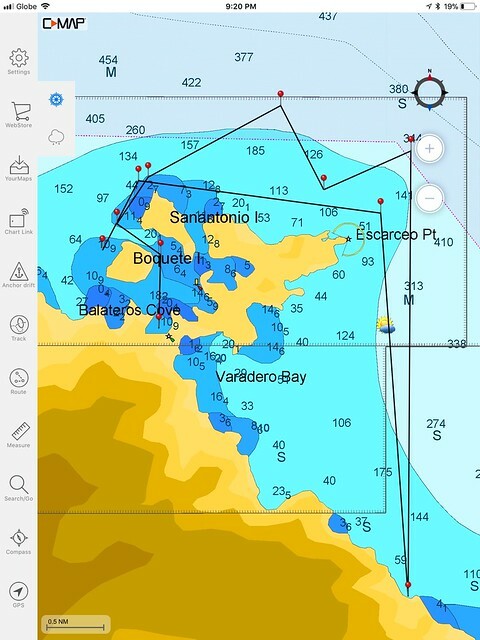 Around 30 minutes before our start time we set the main and, together with the two cruising boats with start times before ours, tried to get familiar with the wind and location of the start line. Around 6 minutes before our start we killed the motor and pulled it up. One minute before start we raised the gib. Angela was counting down the time. All went as smooth as a clockwork of one of these self made wooden wall clocks. We crossed the start line with a less than a minute delay, bloody awesomely good we thought, considering that this was our first regatta ever. There was hardly any wind so it was not a difficult task though. 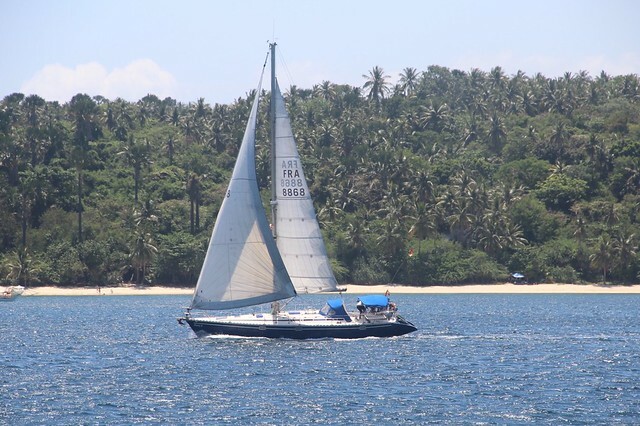 Out of the Puerto Galera Bay, through Manila Channel, leaving Long Beach on starboard, around North Point and then through Verdi Island Passage, tacking eastwards upwinds along Coco Beach, Big Lalaguna, Small Lalaguna and Sabang. One cruising boats and one multihull turned westwards, the opposite direction, which caused some doubts about whether we were listening well during the skippers meeting. Turned out that the skippers of those boats had not joined the skippers meeting, asked by radio about the course, and were given the wrong name of the village with the turning marker by the club. Turning around Escarcedo Point with the the light tower South, and then on an easier course towards the boy at Varandero Point. 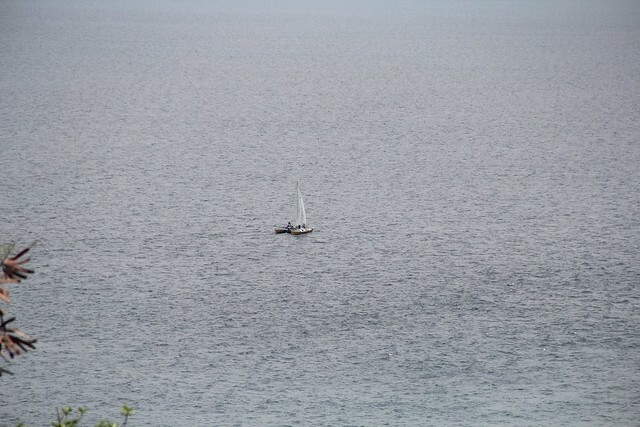 We left the boy on starboard at what felt like midfield of the boats, many had overtaken us. Then sailing back with the wind getting a bit stronger, and getting stuck too close to the shore without speed having to turn into Markoe Cove for picking up speed and tacking out of it again, which was material for some jokes during during the party in the evening. Turning around the Escacceo point again and then reaching back towards North Point at pretty good speed. 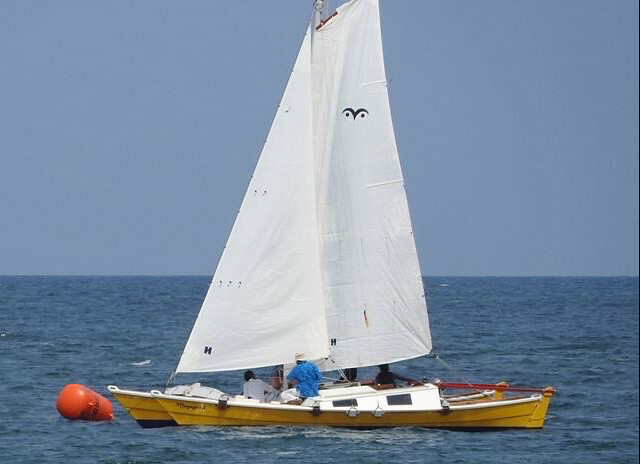 We thought we did not so bad despite the sailing mistake considering that this was our first regatta race ever. 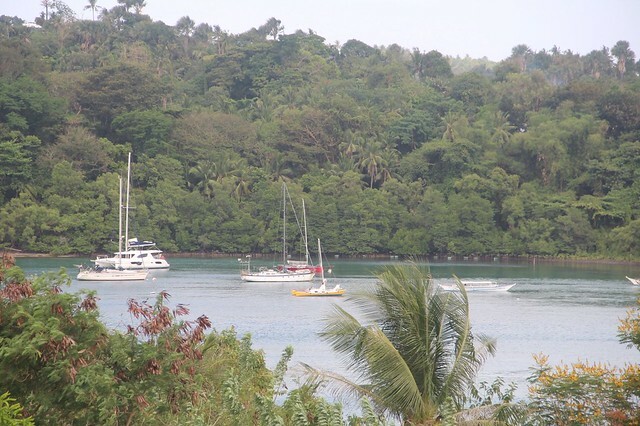 We thought we would be fourth considering that one multihull went to the wrong direction first and there were a total of 5 multihulls in the race. The crew in good mood, nobody panicked, nobody went overboard, nobody even got really soaked, and the uncomfortable bucket toilet only needed to be used once – a nice sail and Martin hoped that it was exciting enough that everybody would join the next day again. 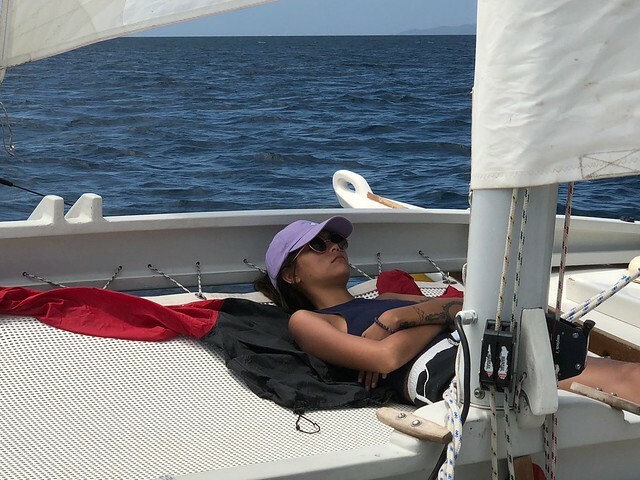 We missed the happy hour, there is only a certain amount of information that we can process, and that was mostly on sailing related things. The party with the awarding of the days prices started without our two models, who did not find enough exciting vegetarian food options at the BBQ buffet, but started with Peter, the Master of Ceremonies, making fun of the two boats that went the wrong way, and then of Magayon II, for “..disappearing into a bay for having a BBQ..”. 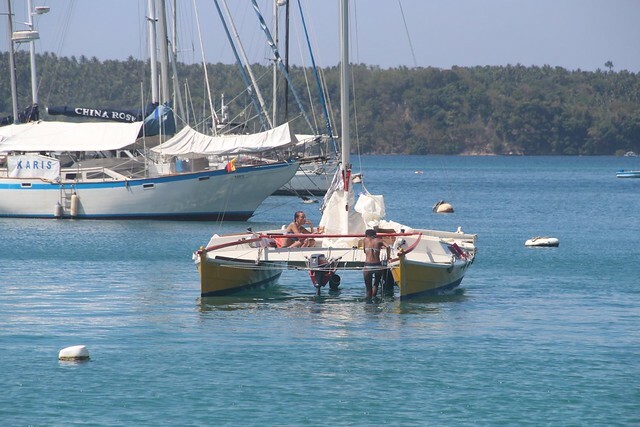 Then the prices for the cruising class were announced, with Xiao Long, a British owned cruiser with three generations on board including young twins who skippered the boat, won second. 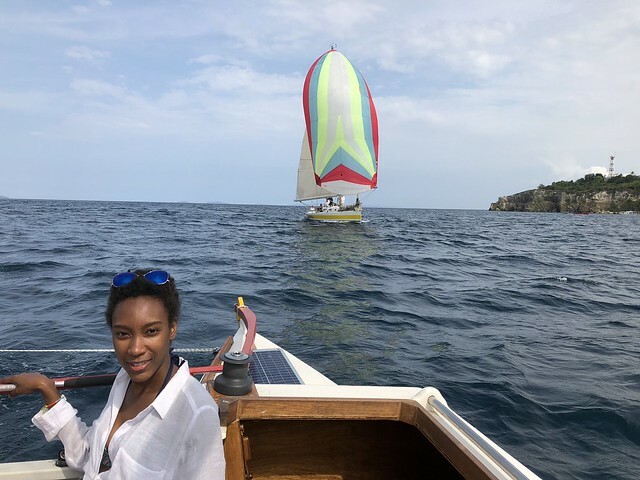 The Multihulls came next. Third price went to MYG 2. 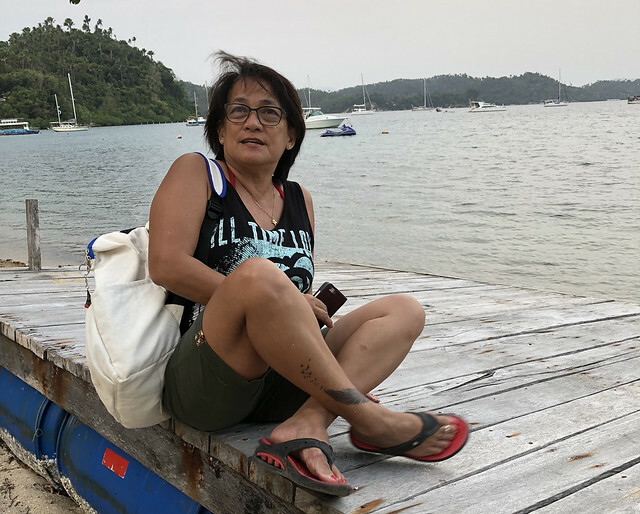 And then, we could not believe it, the second price went to the “.. lovely little Wharram Magayon 2 with Miriam as skipper..” We just did not believe our luck. Our support crew, Mavic, driver, photographer, booking maker, emergency purchaser and logistics manager. Ready for the race. Martin had noticed yesterday that four of the crossbeam lashings had gotten loose again, and in the excitement of yesterday, had not tightened them anymore. So he went on the boat early in the morning to re-do them. Daniel joined Miriam in the Skippers Briefing in instead. Today the wind had picked up and the race therefore was longer. 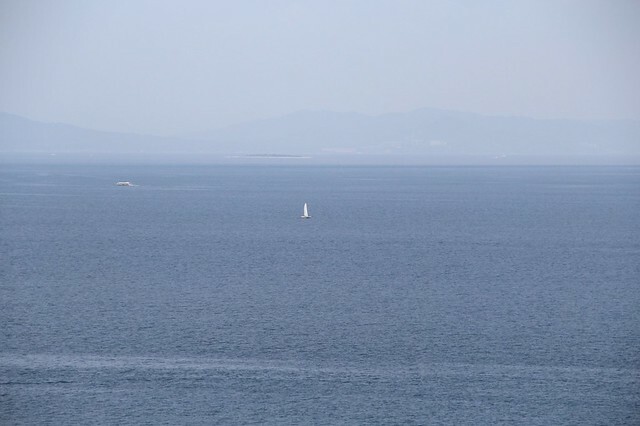 The turning marker for the Cruisers and the Multihulls was off the shore of Verdi Island, around midpoint on the East coast. 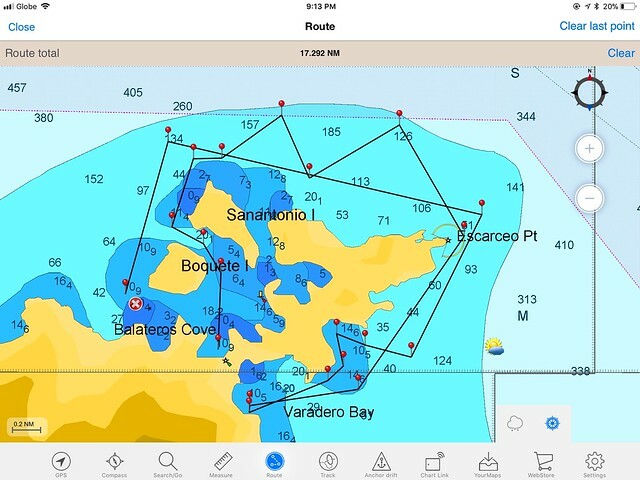 The Racers would have to go around Verdi Island – direction: Skipper’s choice. All lashes tightened, supplies stored, some of the crew decided to go for a dip in the ocean first. Half an hour before our start we detached from the mooring and went underway, pretty much the same way as yesterday. Shekie taking her home on a fast reach. 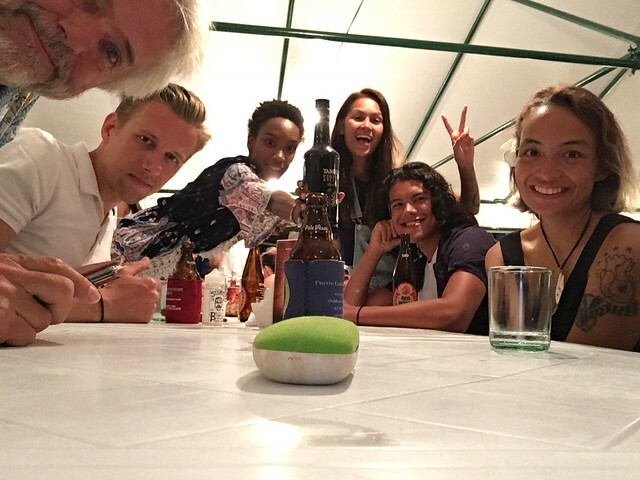 This time the whole crew attended the dinner party, there was sufficient variety in the buffet dinner to satisfy even the non-carnivores. The awarding. We did not expect much, since we won second yesterday obviously because the other boats did silly things like sailing in the wrong direction. 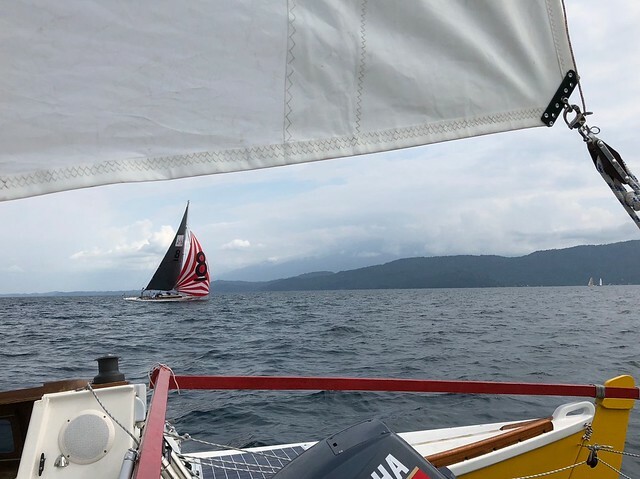 And we did a major sailing mistake today that cost us lots of height when tacking towards Verdi Island, Martin estimated that it cost at least 20 minutes. Third price went to Kerida, yesterday they were fourth, so they had improved. 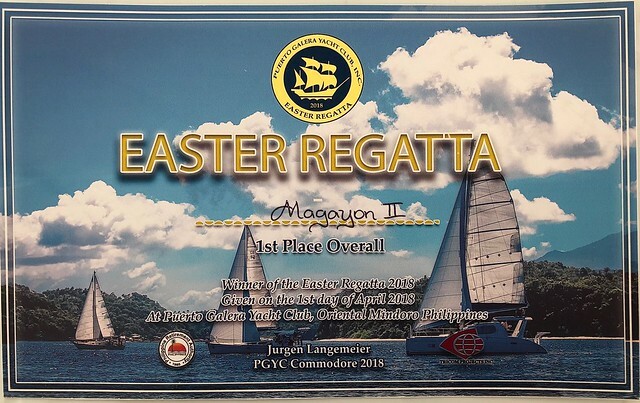 Second price went to… Magayon II. Wow. And first price went to MYG 2. 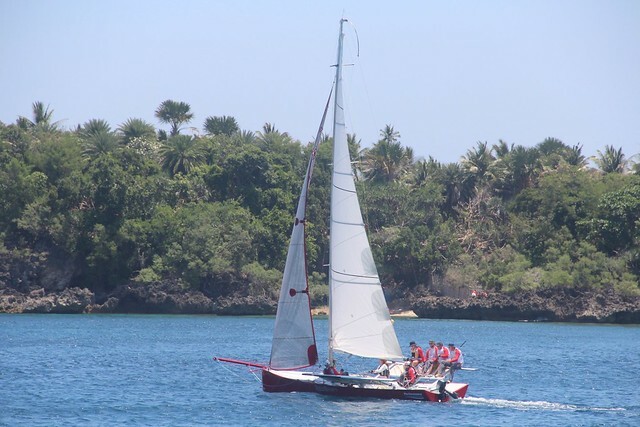 They are a very competitive crew, and have a fast boat, so that was expected. We were all extremely happy, two times second place, what could you ask for more? If we do third tomorrow, we could maintain the second in the Multihull Class for the overall race. Martin joined the skippers briefing again, the lashings had held yesterday. This time the track would be shorter since many contestants needed to start going home in the afternoon. For the same reason our starting time was moved half an hour earlier. Hans’ racer. 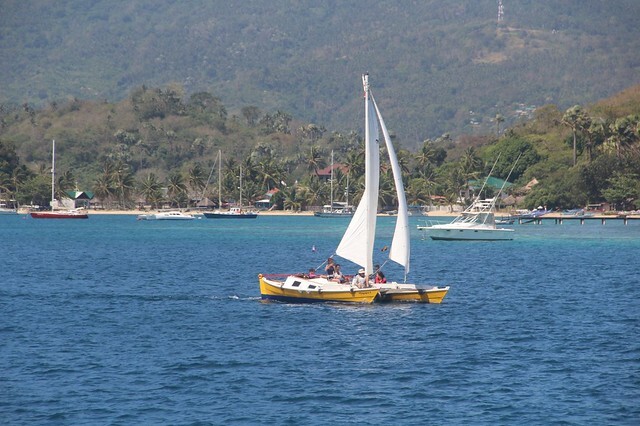 He and his crew had sailed it down from Subic within two days. 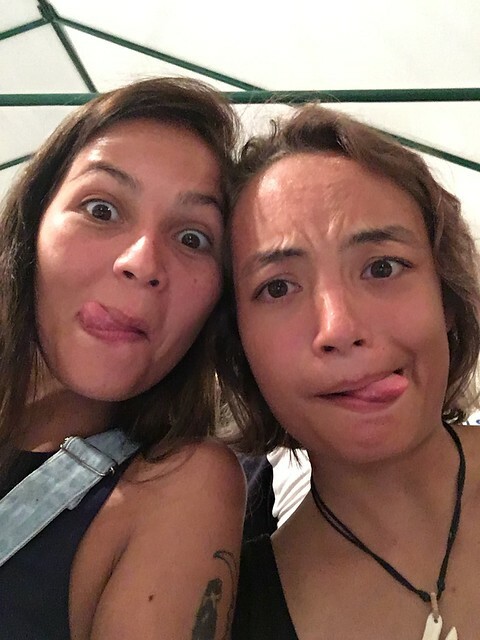 The second day they were sailing for 10 hours. Respect! Early dinner or late lunch was scheduled right after the race. As soon as two people would have arrived the happy hour was open. We intentionally were choosing places in the back since we did not expect to win anything today. 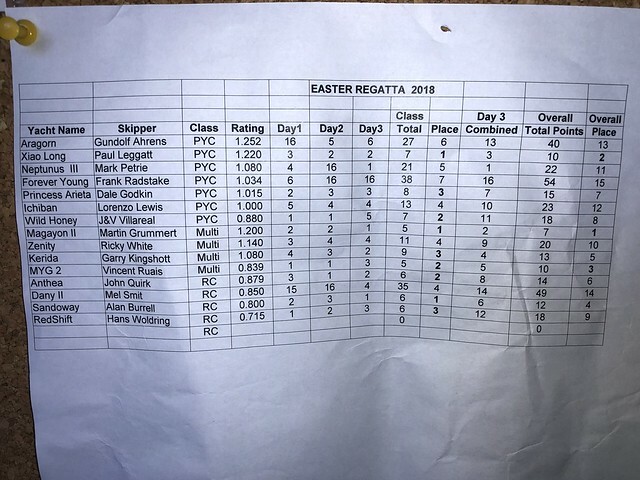 Although Miriam hand done a phantastic race without any sailing error, the other multi hulls seemed to have improved over the last three races a lot. So if we would get third place, we would be very happy. The announcements. 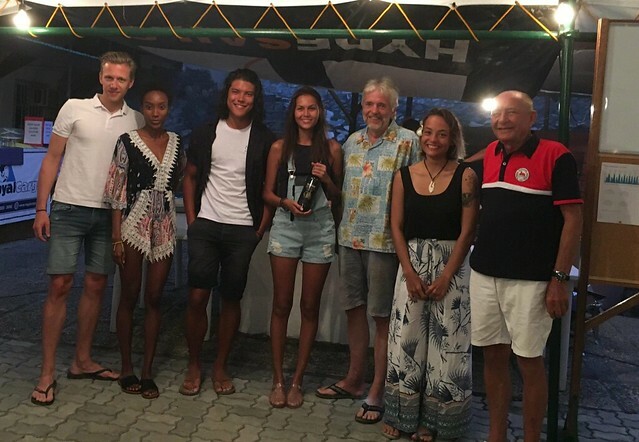 In the Crusing class the British family on Xao Long had won again the 2nd price, we were all happy for them since they were also new and we had enjoyed their sailing a lot. 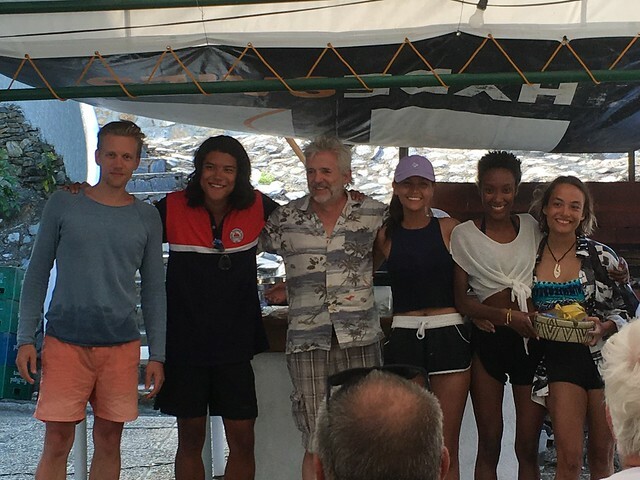 Third place in the Multihull class went to MYG 2. OK, that was it. This time we won’t win a price. Second price went, as expected, to Kerida. So which of the other two had improved so much? “And the first price in the Multihull Class goes to the lovely Magayon II with Skipper Miriam.” We were baffled, and very happy. We rushed to the front to claim the price, a bottle of Tanduay rum. Next was the awarding of the Class prices. This was even better. 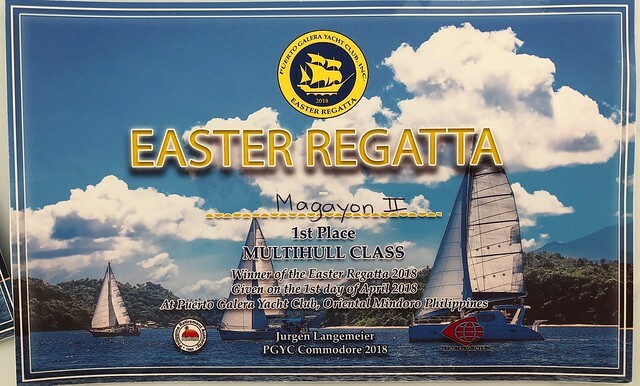 MYG 2 third price, Kerida second price and the winner: Magayon II. We actually had a tie with MYG2, but the rules applied in that case said that the winner of the last race would win. We claimed the price and started celebrating on our table. The last part of the ceremony was the awarding of the overall prices. Martin did not pay much attention anymore. Third price went to MYG 2. Second price, which excited us quite a bit, went to the family with the twins on Xiao Long. The first price was announced, and went to… Magayon II. We looked at each other stunned. We came her to participate and have some fun, and we won the overall price. For the rest of the day we were on Cloud 9.